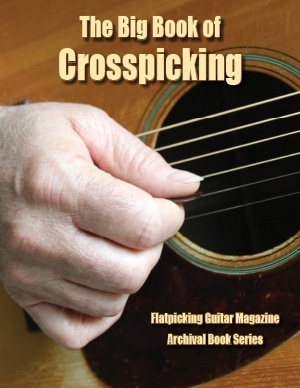 Welcome to the first book in the Flatpicking Guitar Magazine Archival Book Series! Flatpicking Guitar Magazine was published bi-monthly for twenty years, from November/December 1996 through September/October 2016. During that time we featured hundreds of articles that focused on specific flatpicking guitar skills. In this archival series, we will group these specific techniques together so that those flatpickers who are interested in learning a certain skill will not have to wade through 120 back issues to find the articles that are of interest to them. Crosspicking is one of the skills that all flatpicking guitar players should eventually learn. In bluegrass and folk music the technique dates back to George Shuffler’s work with the Stanley Brothers starting in the 1950s. It has been subsequently utilized by nearly every flatpick style guitar player since, including heroes such as Doc Watson, Clarence White, Tony Rice, Norman Blake, and many more. During our twenty years of publication, Flatpicking Guitar Magazine columnists produced 40 articles that specifically related to this technique. All of those articles are included in this archive book and appear exactly as they appeared in the magazine. We also include transcriptions of a few of the tunes whereby George Shuffler famously employed this guitar technique (the last three pages of the book). Included in this volume are articles by Flatpicking Guitar Magazine columnists Dix Bruce, Joe Carr, Orrin Star, Dan Miller, Mike Maddux, John McGann, Dan Crary, Dan Huckabee, Kathy Barwick, Brad Davis, Adam Granger, Steve Kaufman, Jeff Troxel, and guests Adam Schlenker, James Alan Shelton, and George Shuffler.